US inflation measures continue to decline. Government data showed that both the headline and the "core" PCE (excluding food and energy) indicators fell last month. Moreover, the core index hit the lowest level since this data has been collected, starting in 1960. And the core PCE inflation measure is the one most closely watched by the Fed. Some are pointing out that with this indicator at 1.05% there is a real risk of deflation. Whether that's true or not remains to be seen, but we want to keep in mind how dovish the FOMC has been recently. As a reference, below is a simplified version of the Fed's economic "dashboard" that the Dallas Fed president Richard Fisher sometimes uses in his speeches (Fisher is hawkish but is not currently a voting member of the FOMC). 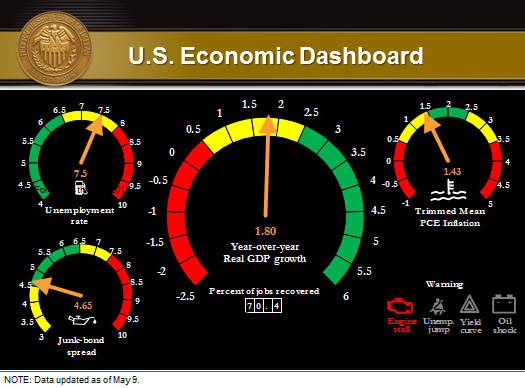 A version of the PCE measure is the dial in the upper right of the "panel" below, pointing to the fact that the Fed deems anything below 1.5% as "yellow" and below 0.5% as "red". We are now about half way between these measures. With such perceived deflation risks in play, the relatively dovish FOMC is likely to press on with securities purchases for some time to come. With the core PCE at 1.05%, the Fed will be worried about the US becoming another Japan, stuck in a perpetual deflationary mode.